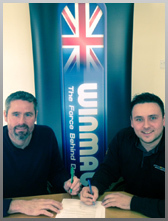 Winmau has signed an agreement with the World Youth Darts Corporation (WYDC) to be their exclusive darts brand. Steve Brown, Chairman of the WYDC, has been developing darts academies for over 5 years, before taking the decision to develop a world youth darts platform that can benefit any existing and new academy that wants to get involved with developing young players aged between 8 and 18. Steve has already been rewarded for his foresight and investment in youth darts, as he has already helped develop 11 academies that have produced over 10 county youth players. The foundations for the WYDC's success were laid down years ago, when Steve wanted to help develop the local Bristol darts talent. He saw so many youngsters who were not given the time to develop and build confidence in their darts game playing under the current adult structures. The WYDC system uses the same progressive idea of moving young players from one colour level to another so that they get to play with and against players of the same level. This has been one of the primary reasons for the success of Steve's academies to date. "Youth Darts is absolutely buzzing," Steve says. "Since developing an exclusive youth structure that allows players to develop and track their progress, the academies have gone from strength to strength. We want to keep growing and to allow other young players to benefit from the WYDC structure . The WYDC depends on likeminded mentors who want to put something back into youth darts and see young people enjoying the game playing a new and exciting system that is not dominated by 501. We aim to be the world's leading light in developing the future of global youth darts in that sense, and we are proud that Winmau have backed the WYDC 100 percent". Simon Hall, Head of Marketing for Winmau, said: "We've seen Steve's efforts in his current academy setup progress in leaps and bounds over the last 5 years. Steve's passion and drive to make the WYDC work is incredible, and we are honoured that Steve and the WYDC chose us to help partner this amazing initiative. We can't wait to lend our help and support to further the global growth of the WYDC". The WYDC system has been designed so that anyone who wishes to set up an academy from scratch can do so rapidly. All that is required is an acceptable location and relevant CRB checks for staff and mentors. The WYDC system is ready to add any new or existing academies to their current platform so the players get to see their results across the entire WYDC rankings week-in week-out. The whole structure is based on five eight week terms that fit in with school timetables.